It’s Time To Talk About Fatphobia « Eric Anthony Grollman, Ph.D. I have been fat most of my life, probably starting around age 7 or 8. As a consequence of our society’s emphasis on thinness and, particularly for men, muscular physique, I have struggled with hating my body most of my life. But, only in the past year or so have I grown critical of society’s prejudice toward fat people (fatphobia). So, with this latest episode of internalized fatphobia, ending with my partner saying, “I really hate when you get like that,” I knew the time was coming to talk about fatphobia, at least with myself. In recent years, I have made (some) peace with my weight. I would rather devote my energy on exercising my mind than my body, though I do know that exercising both is beneficial, and I cannot (and don’t) completely ignore my body. I became assured enough to counter concerns raised about my weight from family members with, “it’s not me who has a problem with my weight.” But, I am a far cry from being a proud fat person. Unfortunately, I still retain enough of society’s anti-fat prejudice that thoughts too embarrassing to share publicly cross my mind, like “oh, I can just starve myself for a week to drop a few pounds.” I am smart enough to snap myself out of it, but it concerns me that such thoughts still cross my mind every once in a while. Why not be proud? I did the heavy soul-searching, and drew on my own strength and the support of others like me to become a proud queer man. The days of considering taking my own life as a consequence of society’s vehement homophobia were limited to my adolescence. And, I have never hated myself for being a person of color, or even multiracial; my parents instilled a sense of racial pride and awareness from my birth. So, why then, do I let fatphobia get to me? What Geoffrey Miller, a University of New Mexico professor who is a visiting professor at NYU, said on Sunday on his personal Twitter account was regrettable. Professor Miller apologized for the Tweet and deleted it. NYU considers the matter closed. But, the audacity to end his tweet with “#truth” — wow. Actually, that is not true. Several PhDs and soon-to-be PhDs have proudly submitted their names and images to a growing list of fat PhDs. And, to add my own #truth, my fat behind sat in my chair for long hours to start and finish my dissertation (on top of applying for jobs) in a year. To brag a little, I put my committee’s concerns to rest that I wouldn’t finish and/or wouldn’t get a job, finishing graduate school in 6 years (one year less than the typical minimum, and two less than average). My decision to eat (rather than lack of decision or willpower not to eat) is irrelevant to my decision to work. (I am actually a little fatter because of working on my dissertation, which is true for many people of all shapes and sizes.) More importantly, it is high time to put to rest the stereotype that fat people are fat because they are lazy. I suspect a second reason that there is a delay in recognizing fatphobia is hesitation to define it as oppression. Sure, we know that fat people are the targets of prejudice. Increasingly, we are recognizing that fatphobic prejudice seems to translate into behaviors and, sometimes, even policies and practices. Yup, with pervasive unfair treatment against fat people, this constitutes a form of discrimination — fatphobic discrimination. And, this discrimination has real consequences for the health, well-being, and life chances of fat people. Beyond interpersonal interactions, there is a constant barrage of negative images in the media, coupled with the medical institution‘s obsession with obesity as a health problem. One of the most appalling things I saw in medical research was viewing positive body image in fat women (as though they are delusional) as a problem, specifically as a hindrance to them losing weight. Certainly perception of one’s body, specifically one’s weight, is a concern in terms of anorexia, bulimia, and other eating disorders. However, I find it troubling to view comfort with one’s body, or even fat pride, as a problem. For now, until we fully tease out how much of the poor health faced by fat people is the consequence of fatphobia, I remain skeptical of the automatic conflation of fatness with poor health. But, does fatphobia constitute a system of oppression? In simply raising the question, the “oppression olympics” come to mind. There is no question that the history of prejudice, discrimination, and violence faced by women and people of color are what define sexism and racism as systems of a oppression. More recent consideration has been given to homophobia and heterosexism, as well, which actually discounts just how old and pervasive they are. But, to my knowledge, fat people have never been enslaved or formally excluded from important social institutions. What further complicates this question is how wrapped up fatphobia is with gender (and sexism) and other identities (and systems of oppression). I do not mean to suggest that attending to these important intersections is bad or even problematic; rather, as an outsider, much of what I have seen around anti-fatphobia activism and scholarship has donned the face of white cisgender women (for now) (but hopefully I am wrong). Fatphobia As A System Of Oppression! But, I stop there. To the extent that fatphobia exists both as pervasive antipathy toward and discrimination against fat people, it counts as a system of oppression in my book. One that deserves no less attention than sexism, transphobia, racism, homophobia, and classism. More work is needed to document how widespread such prejudice and discrimination is, and to eliminate it (e.g., education, changing laws and policies, changing practices). 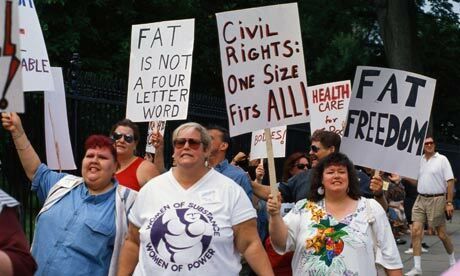 In particular, more research is needed to assess the social experience of being fat (and the extent to which this shapes one’s health), not merely obesity as a “health problem.” And, more energy should be devoted to developing a fat consciousness and, ideally, fat pride. It is a shame that, on top of all of the external hostility and unfair treatment, so many fat people harbor internalized fatphobia; unlike Black pride, grrl power, or LGBT pride, we, as fat people, do society’s dirty work to hate our own bodies (and even other fat people). Okay folks! It is time we start talking about (and working to eliminate) fatphobia. By Dr. Eric Anthony Grollman in Academia, Research and Writing on June 6, 2013 .